Sebastian Vettel did what his home fans expected of him and set the best lap in qualifying to secure pole position for the German Grand Prix. Valtteri Bottas will join him on the front row, followed by Raikkonen who was third fastest. Lewis Hamilton encountered technical issues and is set to start from the back of the grid. Saubers' Leclerc was the first to set a timed lap, soon improved by Grosjean and Hulkenberg. 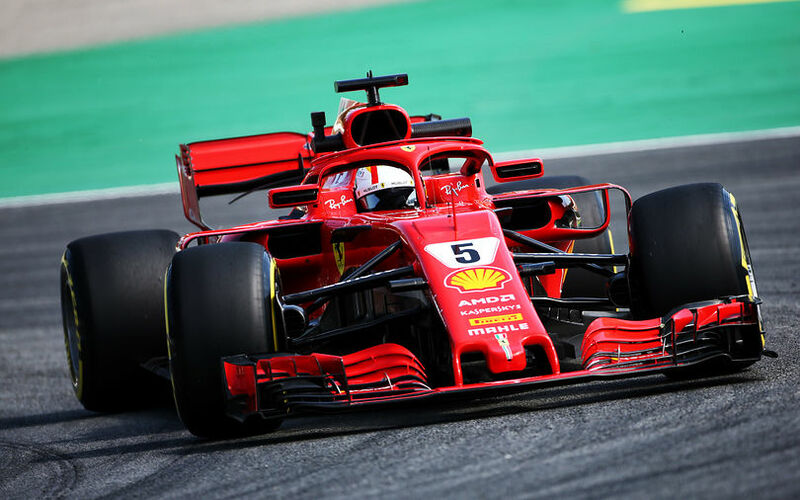 Both Ferrari's were rapid to jump to the top of the timesheet, though they continued for several more laps on the same set of tyres with small improvements. In fact, it enabled Raikkonen to set the fastest time of the session. Valtteri Bottas later slotted into third, getting ahead of Hamilton with his second attempt. The big news for Hamilton though was that despite his time to get through to Q2, he ended up parking his car close to the entry of the pitlane after he came stuck in 4th gear. Apparently, hydraulic pressure was lost, and the team told him to stop out on track, as there was a risk to damage the power unit. Hamilton probably induced the issue by going wide through Turn 2, bumping hard over the exit kerb following which the gear was stuck. Meanwhile, Vandoorne continued his struggles with McLaren and was slowest in qualifying. His team mate Fernando Alonso managed to get through to Q2 with a 14th fastest time, ahead of Sirotkin who also progressed through to Q2. In Q2, Bottas as the first to cross the line, topping Raikkonen and Vettel who set their times two minutes later. At about that time, Markus Ericsson ended up in the gravel trap, but managed to escape it on his own. Good for him, but his venture left quite some gravel on the track itself, including the racing line. It took a little while, and even though the situation seemed perfectly under control, the session was stopped a minute later to clear the gravel from the track. A large sweeping truck was engaged to clean the track, whereas a simple broom may have done wonders much more quickly. The stoppage was a bit of an issue for Verstappen. The latter was doing consecutive laps and building up to an optimal lap on the soft tyres. When the session restarted with 7 minutes to go, Markus Ericsson was the first to venture out on track. Verstappen soon joined the party, and opted to switch to the ultra soft tyre, backing out of the initial plan to complete Q2 on the soft tyres. The second Red Bull of Daniel Ricciardo didn't participate in Q2, given he was set to start from the back of the grid anyway due to penalties for changes of power unit components. Ericsson initially improved to 10th, but in the end that wasn't enough as others improved another time. Leclerc, Sainz and Perez secured their positions in Q3, dropping out Alonso, Sirotkin, Ericsson. Hamilton and Ricciardo's elimination at the time were already certain of course. Q3 was anticipated as a 4-way battle between the two Ferraris, along with Bottas and Verstappen. The first laps though saw Verstappen 4 tenths down on the other three. Vettel didn't disappoint at shot to the front, ahead of Bottas and Raikkonen. What followed was a reasonably long period of waiting, as with such a short circuit, drivers were waiting for the right time to get out, hoping to benefit from the best possible conditions at the end of the session. Raikkonen as first out on track, and improved to go up into second, just 0.008s down on Vettel's first lap. Bottas then, who recovered from a troubled warm-up lap moved to provisional pole for about 15s, until Vettel shaved off another 2 tenths to take pole position. The first time since 2010 he managed to do so at his home race.